AlienWP Themes are clean, minimal and professional WordPress themes that make your blog look elegant and conversion optimized. Check out the live theme demos by clicking the button below. If you’ve a business website, I am sure you know the importance of minimal and professional WordPress themes. A fancy looking site that just distracts your reader is the worst thing you could do to your business. Research has proven time and again that site that is clean, has professional and simplest themes around converts far better than the former. For example, when 37 signals wanted to boost conversions for their HighRise CRM Software, they split tested so many changes on the website and the one that was focused on professional, clean look and long-form content registered a record 37.5% increase in conversions. I have previously posted about Elegant Themes review, and even had a combat of WordPress themes in which I compared Thrive Themes vs Genesis vs MyThemeShop and Divi vs Thrive Themes vs StudioPress themes in which I talk about the importance of conversion focused minimal blog design. In today’s article, we’ll have an exclusive AlienWP Themes Review which are known for their simplicity yet affordable WordPress themes. I recently discovered AlienWP WordPress theme shop when I was searching for some free minimalist WordPress themes for one of my client projects and I instantly fell in love with their premium themes too. AlienWP has just 20 themes and 2 plugins at the time of writing this post but compensate this with the range of themes they have; business WordPress themes, portfolio themes, high CTR AdSense optimized magazine themes, and eCommerce themes to name a few. AlienWP had released 5 free WordPress themes on Official WordPress repo with over 40,000 active installations. It is often very hard to provide good products with consistent support and that’s where AlienWP stands out from rest of the marketplaces. AlienWP believes in quality over quantity and thus they provide great products with great support. Currently, AlienWP provides themes and plugins on their official website. There are 20 themes and 2 plugins from which you can choose your best theme or plugin that matches your requirements. Please note most themes are simple and clean business themes. If you want a multipurpose theme, you’d rather be checking my Divi theme review out. Portfolio Themes: Althea, Oxygen, Origin, Cell, Hatch Pro, Ascetica, Hatch, Apataki and Mantra. Free Themes: Oxygen, Origin, Ascetica, Hatch, Convention, Aura, Elegant White, Simple Style. To be honest, I am not a really big fan of sliders but if you are, you should check these out. With this, we come to our AlienWP Themes review section. AlienWP might not be the best selling WordPress theme shop but they definitely do their best in making clean and professional WordPress themes accessible to everyone at affordable price. Free Minimalist WordPress Themes: Most of AlienWP themes are simple, conversion optimized themes that do well not do distract the readers. They have a great collection of free and simple themes and some awesome themes that you’d love to upgrade for. Easy to Setup and Customize: Since AlienWP themes are simple and minimal themes, they are very easy to install. The theme documentation, installation videos make it newbie-friendly to install and launch. Conversion Optimized: The worst thing I can remember about modern WordPress themes is the bloat they add to increase their selling factors. The unlimited homepage layout designs, boated shortcodes and animations all make it hard to install and launch a theme.Thankfully, premium themes like StudioPress, Thrive Themes and AlienWP focus on bringing functionality over looks. Feminine WordPress Themes: If you’re a female blogger looking for some affordable feminine WordPress themes, AlienWP has got your back. They have some of the most beautiful girly and feminine WordPress themes that will win your readers. 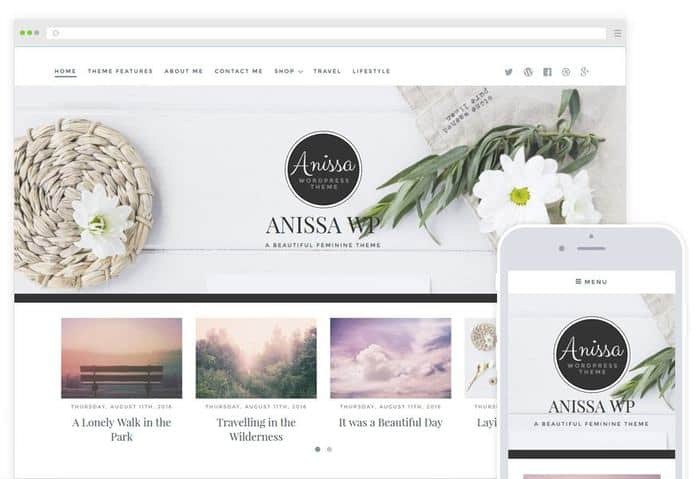 Anissa is one such feminine WordPress theme with Woo Commerce support. Friendly Customer Support: The second most important feature I check out in a product I buy, after the quality of the product is, customer care or after sales support. AlienWP does a great job with a responsive customer care and 2 of the 2 doubts I had got addressed on the same hour. Please Note: If you’re looking for a done-for-you package of the best WordPress blog themes, free hosting, list building plugin and support for podcasts etc, you might want to check our StudioPress Sites review. Click the image to view the theme demo! If you are looking forward to that one theme which can work on most of the niches then Anissa is your best choice. Anissa is a beautiful feminine blogging theme which is designed with elegant typography and post styling. Theme also support sliders which gives great look on website. Anissa offers custom backgrounds, stylized widget areas (has an elegant about me widget with picture and link settings), minimal design to give your content wings, and is SEO optimized to boost your search engine rankings. Mobile responsive nature of Anissa makes it perfect on all screen sizes. If you want to use Anissa as eCommerce theme then there is a WooCommerce support provided. Integration of WooCommerce in Anissa is quite easy and fast. 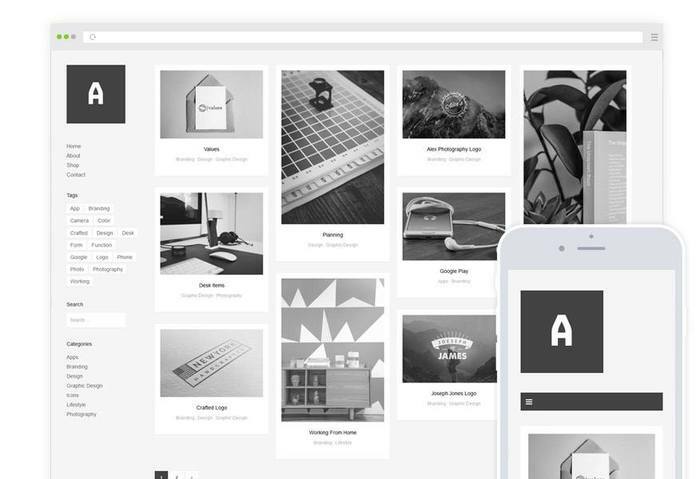 Althea is another modern WordPress theme with grid layout. It has got Woo-commerce support like Anissa but can also end up being a good simple portfolio theme as well. So if you are designer, artist or photographer who wants to make WordPress site to showcase talent then you should go for this theme. On homepage of Althea, you can show case all your work in grids easily. Due to responsive nature of Althea theme, these grids will rearrange themselves when you change the screen size. If you integrate Althea with WooCommerce then you can use Althea as eCommerce WordPress theme as well. Theme is having good support of WooCommerce integration. When it comes to pricing of themes and plugins, you get lot more as compared to the price. They are affordable at best with over 20 themes costing only $59 for unlimited usage. This is a LOT cheaper than most themes which start at single themes being sold for $59. If you want the plugins too you can opt for their developer package where you also get a bonus website hosting at InMotion, a free domain and $300 Adword credits. So this is something I never saw coming on a theme purchase. It’s cool if you want to set up a new website with everything from one place. From what I saw and used, AlienWP WordPress themes have got substance in them. They are clean, minimal WordPress themes designed for professional websites. If you want a simple WordPress themes without putting a dent on your wallet, you should try it out. They also have various free themes both on the site and on the WordPress repo in case you want to try them out without committing to them. What are your views on AlienWP? Have you used their themes? Share your experience with AlienWP via comment box. Share this post with your friends to let them know about this awesome theme providers. I love their theme and my blog is using their theme Oxygen. Alienwp looks very impressive by going through your article. Lots of varieties to choose from and the key point is they are easy to understand and easy to get going with. I am looking forward to try my hands upon this.